← Deception the Greatest Weapon of Satan! Why I’m Not A Christian Anymore! A Christian’s Response to a Fool! (Ver 1.1) I was reading the internet blogs the other day and I ran across one that particularly stood out to me. This guy was disillusioned with Christianity and Christians and he gave us his list of the top 20 reasons why he walked away from Christianity. So this is my response to a fool. The Bible says a fool says there is no God (Ps 14:1). I guess this guy is just an example of someone who still has a very lot to learn, but is also someone who refuses to allow anyone to help. People who close their minds to God, and to His truth, and to His messengers, cannot be helped and that is very, very sad. That is the definition of a fool! So here is the list of excuses of this fool and my response to each. For those wondering, here is a condensed “Top 20 List” of the things that led to my rejection of Christianity. 1. God is wrathful, jealous, hateful, and kills nations of people like it is a bodily function. He is certainly not just or “holy” in nature. Please tell me which God you are talking about? You are not talking about my God or the God of the Bible, so I assume you are just ignorant and are making wild accusations based upon misinformation. Which nations of people are you talking about? What has God done that you can prove in a court of law? Or are your words all the proof we need to believe in what you say? 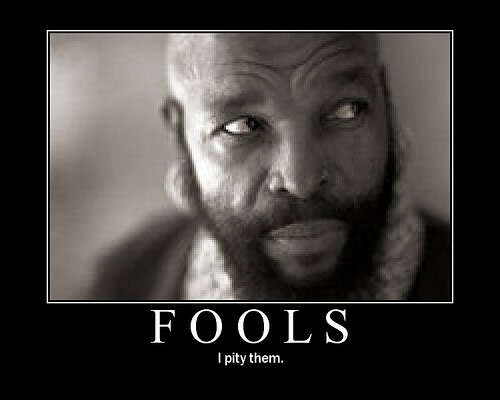 You are truly a fool. 2. The act of throwing people into infinite torture and punishment for not believing a Jewish guy from 2,000 years ago was God’s son, or unknowingly worshiping the wrong god, is extremely cruel and sadistic. Why do you think that people like me spend so much time in trying to get people like you to believe in this Jesus? I mean there must be a good reason for this extraordinary effort? I believe it is important, even if you do not. There are countless Christians on TV, the internet, in books and in person who try to get people like you to see the truth? You must think that we are all just, stupid and wasting your time. Jesus told us to go into all the world and preach the good news that God is not mad at you and He has forgiven you and made it so easy to get saved. All that you have to do is believe in Jesus being raised from the dead and you are saved. Why is that wrong? I suppose your way to get people saved is better? I suppose you have a better way than God’s way, so you must be smarter than God? You obviously do not want to know the real truth and have already determined what you think is the correct way to salvation. 3. The statements, “God works in mysterious ways,” or “It will all make sense in heaven,” are little more than irrational cop outs. This God allows horrible atrocities to be committed against innocent men, women and children every day. This is probably one of the few areas that I tend to agree with you on. Christians can be as stupid as non-Christians sometimes. Because they do not know how to answer a question and do not want to appear ignorant or foolish, they make up a religious answer like “God Works in Mysterious Ways”. That is a cop out and I would say that it is the wrong thing for them to say. It would be far better for a Christian to say “I don’t know” than to give you an opinionated answer like one of these. But, to respond to the last part of your statement, I have to say that God also allows what you allow to happen. God did not commit the atrocities that you claim nor even permit them. The Bible tells us that God is not the god of this world system (2 Cor 4:4), God is not in control of what you do, or I do or anyone else in what they do either. God will let you go out and commit 150 murders tomorrow, if that is what you want to do. So who is doing the evil, you are God? If you are doing the killing then you are doing the evil and not God. You might accuse God of not being just, because He does not choose to stop evil when He clearly has the power to do so. However, is stopping the evil in the world from happening going to fix those who are evil, that commit these atrocities? What do you suggest that we do with all of these evil people? I suppose in your mind God should put ropes or chains on all of them and control their every step and action. Is that the kind of God you want? Is God the Puppet Master in the sky that is suppose to pull all of the strings and make things happen like He wants them to happen? Is that the kind of God you want? 4. Bloody animal and human sacrifices are illogical demands by a divine god as payment for petty wrong doings. These actions are no different than the rituals of archaic pagan religions. Not to mention the bizarre ritual of symbolically drinking human blood and eating human flesh. You speak of “petty wrong doings” in this statement and horrible “atrocities” in your previous reason. You obviously accuse God of doing these horrible atrocities and men of doing only petty minor offenses. What happened to the terrible deeds that men do to the innocent? Do they not deserve any punishment? If someone kills a couple of cops, should we let them out and just go free? What happened to the horrible stuff that people do to innocent, men, women and children? You are obviously the one that is confused and illogical. Your mind and focus is shifted depending upon your attempt to make your mindless points. You are inconsistent, irrational, illogical and ignorant. God is not guilty of atrocities and men are guilty of more than petty offenses. The Bible says “Woe to you who calls evil good and good, evil” (Isa 5:20). You are clearly a fool! 5. If God loves us and wants us to know and believe in him, why be so completely invisible? What is the purpose of being so illusive to those who believe and worship him? Again you do not know the God that I know. God talks to me and holds conversations with me and teaches me stuff every day. This is called a relationship. If you do not know God, then God does not know you. God is only invisible to those who do not believe in Him. God only speaks to those who want to hear from Him and are listening. Then there is the bigger problem, in that you do not know how God speaks so you do not know when He speaks. You might be expecting God to speak to you like your parents did maybe in an audible voice? However, God does not speak normally in audible voices that everyone can hear with their ears. God does not suddenly appear and prove His existence to anyone. However, this does not mean God did not leave you enough clues, if you wanted to see them. This also doesn’t mean that God does not speak in your heart. If God proved to everyone that He was real and existed, you would have no further choices to make in life. Salvation would no longer be voluntary, it would be compulsory. God will never overrule your right to be wrong. Either learn to hear God on His terms or shut up and I’ll talk to Him. 6. God never manifests himself or performs miracles as he regularly did for the Israelites in Old Testament stories. Again, your narrow perspective and lack of understanding is clearly demonstrated. Says WHO? Are you God, are you everywhere at once in the World? Do you have cameras in every corner of the world? Do you know every human being? Have you interviewed every human being to see if God has done anything great and spectacular for them? So obviously you are an egotistical bigot who is ignorant and has made the wrong assumptions. You cannot prove anything you have said. Any fool can type words and raise baseless questions and conjectures. Your ignorance overwhelms me! 7. Prayers are never answered. Certainly not in the way Jesus described. Prayer has absolutely no affect on the world around us. I guess you are again speaking of personal experiences and maybe some testimonies of a few of your nameless friends. You are either praying to the wrong God, or praying the wrong way to the right God, asking for the wrong things, or just making more ignorant accusations. You cannot prove this statement either, so you are clearly very foolish in what you say. I know that God will answer prayer and He has for me. I can state for a personal fact that what you said is false. I do not base your lack of confidence in prayer as a basis for my results. So what do you base your lack of results in praying on? Do you think no answer means, no God? Could it be something else? Could you be the problem and not God? Could God be waiting on you to change so that He can answer your prayer. You should really think more before you speak! 8. Jesus did not fulfill major Old Testament prophesies or even fulfill his own promises and predictions. So who died and made you the Bible expert? You obviously do not know how to read, so I have no response for stupidity. There are so many books and references on this subject, if you were interested in the truth you would have tried to do some research before making any such idiotic statement of falsity. Go into your Bible and read it and prove to me and the many other Christian authors wrong, if you can! Give me the Bible verses that Jesus did not fulfill. I’ll will bet you that cannot do it! 9. The authors of much of the Bible are unknown. And of these unknown authors, the men who wrote the gospels likely never even met Jesus considering they were written 40-70 years after his death. A far cry from reliable testimony. God knows who wrote every book of the Bible. It was God! You obviously are looking for excuses and I still have no response for stupidity. 10. The Bible is repeatedly contradictory with itself, reality, and the laws of morality. Couldn’t God inspire a less poorly written book? The opinions of children are normally the same response as yours. If you gave a 6 year child a textbook on Calculus and asked their opinion on what it says, they would say it is a stupid, and a poorly written book. Because you do not understand what is written, you believe it has errors and contradictions. God who is the most intelligent individual you will ever attempt to understand is so far above your level of intelligence that you are a fool to think that you can read the Bible and just automatically understand everything that it says. You should approach the Bible with a different attitude and you might be able to begin to understand that God’s intelligence is infinitely beyond your capacity to grasp anything that He says right now. God will come down to your two year old level, if you are sincere and want to learn. However, God also expects you to grow up and mature. God says that a natural man will never understand the things of the Spirit of God. Because you do not understand the Bible, proves how natural you are. God wrote a book about spiritual wisdom and information that is impossible for natural little children to understand. God wrote a book that allows you to have choices and make decisions. God did all of these things so grow up or shut up. 11. The Bible is open to interpretation. Everyone interprets it in the way that suits them best or serves their purposes. You know here is another area that I have to agree with you on. Many Christian’s approach to the Bible is just wrong. They are looking for words and teachers to promote their life styles or their sins. However, much of what people call science is also open to interpretation. Do you discredit and reject all of science, because every scientist does not agree? You can find just as many opinions and theories of how the universe began as you do with church doctrinal differences. If you gathered 100 people in a room and discussed any subject, how many could you get to agree about anything? So your argument is baseless without facts and just erroneous. You do not throw out the Bible or Christianity because you cannot get all 100 people to agree. 12. Throughout history, Christians have justified horrific actions by the Bible and its teaching. Another lame excuse without any proof. Maybe you are talking about the crusades or something else, I do not know. The errors and mistakes of men who called themselves Christians, do not discount or invalidate God or the Bible. If you are looking for Christians to be perfect you will be sadly disappointed. If you are looking for Muslims to be perfect, you will be sadly disappointed also. There are no perfect people in the world, we all make mistakes. Just because someone says they are a Christian, that does not make them a Christian. Jesus tells a story of people who will say “Lord didn’t we do many things in your name” and Jesus says “Sorry depart from me, I don’t know you”. These people thought they knew God and thought they were Christians, they thought they were doing the right things, but they were not. 13. The Bible promotes hate and persecution against women, homosexuals and those who worship other gods or no god at all. You are obviously not going to the right churches! True Christianity is a church that Loves others and does not promote hate! Just because someone stands up with a sign that says “God Hates Homo’s” is just their worthless opinion. There is really no difference between their worthless opinion and your worthless opinion. If God hated Gay’s he would not have died for them to get saved. The wrong actions of people who say they are Christians, should tell you that you need to go to another church and not give up on God and the Bible. There are many good churches who do not promote evil, hatred and bigotry. But, yet I am also saying that these good churches do not tolerate sin either. Sin is still sin. God loves the sinner, but hates the sin that they do. There is a major difference. You can change and repent of your sin. God can change your heart so that you do not want to sin anymore. 14. According to the Bible, nearly 70% percent of the people in the world will burn in hell because they don’t believe Jesus was the son of God. I do not know where you get your figures, I guess you pulled it out of the air and made it up. However, if you know that is what the Bible says and still want to go to hell you are an idiot and a fool. 15. The only reason I was a Christian was because I was indoctrinated into the religion as a child as a result of the culture and region of the world in which I was born. So what would your chance of salvation be, if you were indoctrinated as a Hindu? Would it be better or worse? Do you think that the truth is somewhere else? Where is your internal and eternal peace found? Rather than being deceived into believing that the truth is somewhere else, why not be thankful that your parents were in the right place for you to have the opportunity to see the truth? 16. Christianity has no more rational or factual foundation than any other religion on earth that I openly reject. The proof of the facts in the Bible are overwhelmingly different than any other religion, but since you are not interested in hearing it, I have no comment for stupidity. Plus I already told you that true Christianity is not a religion, but a relationship with God. A religion is just man’s attempt to please a God that they do not know. 17. The Christian church is disjointed and can’t even agree with one another. So are the Muslims, so are the Hindus, so are the atheists. Your argument is idiotic. As I said before, if you get 100 people together and 50% of them will believe one way and the other half another way. You just cannot get everyone to agree on anything. Have you ever tried to listen to eye witness testimony at a trial? You usually can’t get two eye witnesses to agree on everything that they think they saw. This is just human nature and part of the quality of men that make them unique and individuals. We all have different gifts and abilities. Some see things logically, some do not. Does that make any of them wrong? 18. Christians are not at all ethically or morally different from non-Christians. You obviously do not know any true Christians. You should hang around the right people and quit judging others. I’ve already told you that there are no perfect people in the world. Even Christians will make a mistake, so show a little compassion and pray for them, do not be a hypocrite that does not see the plank in his own eye. 19. Today, powerful church leaders steal, lie and molest young children. The church repeatedly attempts to cover up these atrocities, only to reluctantly apologize as a last resort. So you are still looking for a perfect Christian to prove to you that God is real. Men and women will always let you down, so you are looking in the wrong places to find God. I do not defend the mistakes of preachers and church leaders that should know better than to do some of the things that they have done. But, they are not my God and I do not reject God because they have failed. My eyes are not on a preacher, a church leader or even a church denomination. I look to Jesus the author and finisher of my faith and I refuse to let what others do affect me. 20. It is absolutely irrational to continue to believe archaic teaching with the amount of knowledge we’ve gained through science and technology. The Bible reads like a book of primitive folklore, not divinely inspired insight into our true reason for existence. So again I have no answer for the words of a fool. You have made yourself wise in your own eyes and as a result you are portrayed as a fool. You have placed too much value in the words of science that have changed radically in the last 5o years. Whereas the Bible never changes, the Words of God are relevant, consistent and constant like He is. There is no revised edition of the Bible with corrections, it still has the same words that were true 2000-3000 years ago. There is still more that science does not know, than what science does know. The textbooks cannot keep up with the revisions and changes, they are happening too fast. You are placing all of your faith in a moving target and God says He never changes. Jesus is the same today as He was 2000 years ago. That is consistency that you can count on. Nobody can make you see the truth, it is not my responsibility to make or get you to believe anything, so you will lay in the bed that you have made with your own hands and you will be consumed with the reality that you have invented in your own mind. I pray that your eyes would be opened and that you would see God and to know Him and the reality of the truth. But, if you still refuse, God have mercy on the soul of a fool! Posted on May 18, 2010, in 2010 Stupid Awards, Stupid Awards and tagged Bible, Christianity, Church, God, Holy Spirit, Interpretation, Jesus, Prophecy, Religion, Revelation, Salvation, Satan, sin, understanding. Bookmark the permalink. 3 Comments. I am a Christian and I read your response to what that person said, and you went about it the wrong way, one of the biggest responses to Christianity is that we are hypocritical by using hate against others. And no offense meant but you portray yourself as one of those hateful judging people. Look at the title you call the man a fool, and multiple times in this you say he is idiotic, or a bigot. If you genuinely cared for this person as a Christian should, you would not use words of hate, but should present your arguments which are valid in a way that is not offensive so that people will actually be willing to listen. Thanks for taking the time to read my blog. I value your time, your comments and your life.